I can’t wait to go through all of this!!! Thanks for your comment. You have a fantastic site and from reading it I got the feeling you are already in the “depressive position” / “therapeutic symbiotic mental state” some of the time. I am sure that will increase more in the future. In this article, I made the phases (paranoid-schizoid and depressive) sound a bit black and white or all or nothing to distinguish them. That is of course not really the case – it’s a continuum and people experience different degrees of good and bad functioning and feeling over time. In Kleinian terminology, that means being more or less securely or frequently in one or the other state over time. Please can you delete that comment, and I’ll repost without the redirect, for privacy reasons?! Andrea I think I deleted it. Feel free to repost. It is nice to hear from you. So interesting….thanks for writing this Edward. 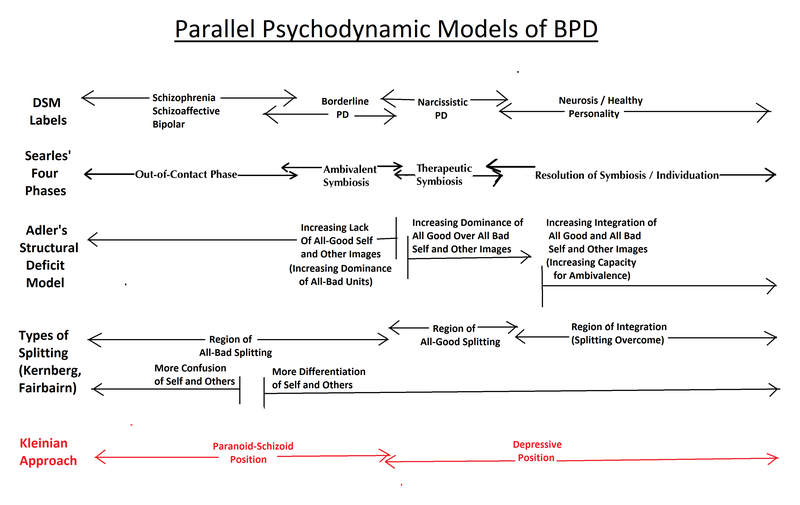 I really think these theories also apply for dissociative disorders – I think a lot applies to me, and I’ve not been diagnosed with BPD. My T said early on that I ‘live in a dangerous world’ – that is, I see everything as somehow dangerous to myself. I’m working on changing that, and it does feel great to start coming out of that mindset. Hi Ellen, yes these theories of borderline states do apply to dissociative conditions also. In fact, borderline disorders are by definition dissociative. That is what splitting is – a dissociation of all-good from all-bad perceptions. Of course, with serious dissociative conditions in which there are alters, the mind subdivides even more so that entire areas of the personality become autonomous. Usually I think each of those areas has all-good and all-bad split units occurring within the different self-states. If the person were healthy/neurotic/capable of ambivalence, they would not have had the need to develop alters and severe dissociation in the first place. So dissociative states require and imply severe trauma/psychopathology. I think it’s correct that severe dissociation occurs when the person feels and functions in a paranoid schizoid mode, in ambivalent symbiotic or out of contact states, and experiences a structural deficit of positive self and object images… these are all ways of saying the same thing that you are saying when you refer to the feeling of living in a world that feels dangerous. A good writer on dissociative conditions by the way is Colin Ross and his book Schizophrenia: Innovations in Diagnosis and Treatment, which discusses psychotherapy of dissociative states of mind along with psychotherapy of more severe frank psychoses. Another fabulous book on dissociation which I recommend even more is The Inner World of Trauma by Donald Kalsched. It traces dissociation in myths and legend throughout history, and shows how these myths teach us things about the dissociation people experience today and how to heal it. 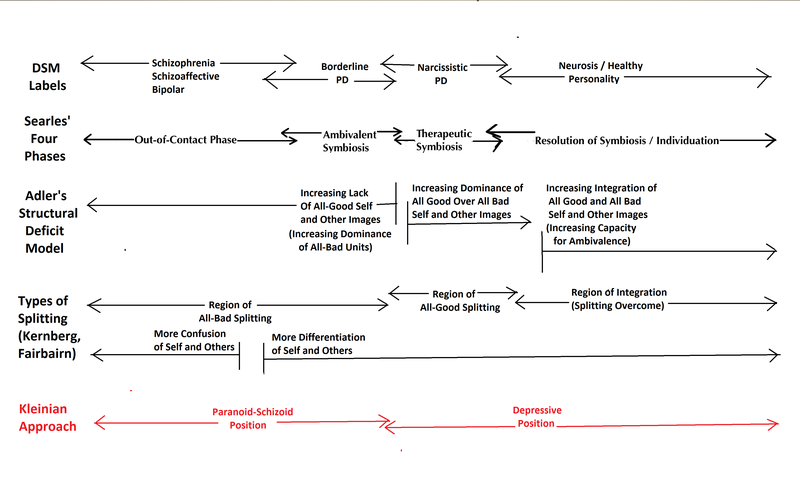 It also discusses how dissociative states relate to borderline and psychotic states developmentally. I need to write about it here. The study links controlling parenting, including “not allowing children to make their own decisions, invading their privacy, and fostering dependence” to poor mental health throughout later life, in contrast to parenting exhibiting “warmth and responsiveness”. This supports the object-relations viewpoint, in terms of parents supporting/preventing a child from individuating, and is positive evidence in favour of these empathetic parenting styles. This is interesting thank you, and it makes sense of course. Most people can relate from their personal experience that positive, trusting relationships with friends and family are crucial to wellbeing and good functioning. Bad relationships make things worse, and no man is an island. What an incredible resource this site is. I found this article helpful and it was particularly useful to read about your experiences both in paranoid-schizoid functioning and in depressive position functioning. It’s rare to read about people’s actual felt experiences in relation to the theory and this gives a sense of hope to people who have not yet completed their development. I found the links to other, related models useful too as I hadn’t heard of some of them before. Suzanna, glad you came across this page and found it useful. If you come back, feel free to share a bit of what your background is (professional, someone with lived experience of extreme distress, family member etc). I am always interested to hear briefly about what brings people looking for more in depth information about experiences that get labeled “borderline states”. And yes, I love the psychoanalytic / object-relations approach to borderline conditions (of which Kleinian theory is one strand). I think it offers such a potent, adaptable way of conceptualizing normative emotional development and problematic/distressing emotional development. Hi Edward, thanks for your reply. I’m spending a lot of time reading your empathetic posts and links to other resources, thinkers and books. It’s a huge relief to find such a positive, anti-medical model blog that includes such a sensitive and personal testament to how what is essentially deep trauma can be transformed. Optimism, encouragement, insight and hope is woven into every post and for that I’m very grateful. My interest is purely personal. I’m in psychoanalytic therapy currently with a therapist who would never use any BPD labelling and is entirely trauma-focused. I’ve read Klein and Fairbairn for several years but am enjoying discovering the work of others referenced on your site. I’ve discovered that while reading the theory is useful in that it encourages recognition of various emotional states and helps to put words around them, the real work can only be done through experiencing a new relationship and working through the trauma with a safe therapist. I hope more people, professionals and family members discover your blog as it is the most positive resource I’ve found. Thanks Suzanna – I agree, there is no substitute for loving relationships in reality… You might also like this group – https://www.facebook.com/groups/1182483948461309/ – and perhaps also be interested in the groups ISEPP (psychintegrity.org) and ISPS (isps-us.org) – I’m a part of those and they helped develop my views. Also, madinamerica.com has been useful. Really nice way of explaining the incomprehensible psychobabble that you mostly find on this subject. A very good read and an interesting view. You’ve thought about this a lot. I agree about the labels. There I’d s kind of spectrum here that defies the attempts at labeling disorders. Psychiatry is really still in its infancy. It could learn more by dropping some of its scientific medical established thinking and looking at how other cultures view and treat this phenomena. Is not ad illness but a mental/spiritual journey. I was recently diagnosed with schizoid-paranoia and my mind just hasn’t been able to comprehend what this diagnosis really means. For the first time in my life, I felt completely defenseless about my mental state. Growing up with sexual, emotional and physical abuser, and with a narcisstistic mother, I slowly “lost” my identity. In my later teen years and early 20’s I managed to live a somewhat normal life with great friends and healthy love life until my mother managed to manipulate herself back into my life. I tried really hard to not lose my identity but in the end, I felt tired of “fighting” for the little self-respect I had left. But still managed to stay in school and keep my job as a nurse (oh the irony lol). I didn’t understand how I was treating the people that I loved and still love so dearly until I lost the love of my life. After that, I completely shut everyone out except my mother. The emotional and mental abuse continued behind closed doors. I’m turning 30 in a few months. Recently, finally managed to make people realize how my mother has been abusing me. People actually believed that I was crazy until they saw and heard it for themselves. Even though I received a bit of a justice, I still can’t trust people anymore. I feel like a lost cause. Just walking among strangers in daylight, gives me anxiety so bad that it gives physical symptoms. But still, after reading this post, I think I still have some hope that I possibly can trust people again. I don’t know who you are but I found your blog through Google and I’m happy clicked on the link.